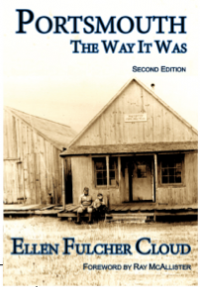 The Outer Banks classic, Portsmouth: The Way It Was, by the late Ellen Fulcher Cloud, is being republished in an enhanced edition May 20th by Beach Glass Books. The $19.95 hardcover, which tells the true story of “the ghost village of the Outer Banks,” will be launched at the Friends of Portsmouth Island annual meeting on Ocracoke Island, concurrently going on sale throughout the OBX. Sales at other booksellers and online begin May 22nd. All are welcome to the Friends of Portsmouth Island meeting at 10am on Saturday, May 20th at NCCAT campus on Ocracoke. Also, on Saturday, Ocracoke's bookstore, Books to Be Red, will host a book signing from 1–3pm. Deidre Ramsey and Simona Rae will sign copies of Portsmouth: The Way it Was in honor of their mother, Ellen Marie Fulcher Cloud. 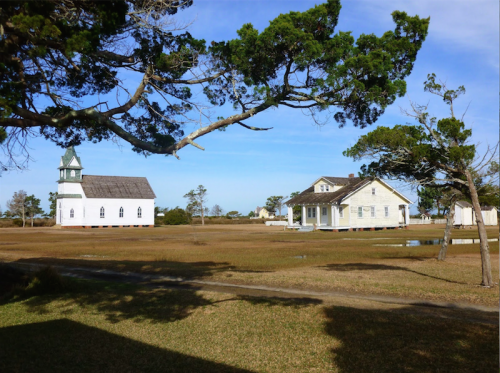 A small, now uninhabited island southwest of Ocracoke, Portsmouth Island was once a thriving seaport serving the North Carolina coast. In the award-winning Portsmouth: The Way It Was, first published in 1996, Ellen Fulcher Cloud recreates the island’s early history based on previously undocumented information: records of storms, wars, and Federal occupation during the Civil War, along with numerous personal letters and photographs. Here, too, are the stories of America’s first marine hospital, established on Portsmouth in 1820; of Dr. Samuel Dudley, the wealthy physician later in charge; and of John Wallace, the businessman “Governor of Shell Castle.” We meet the brave members of the Life-Saving Service, the island’s one black family, and Mrs. Mattie Gilgo, whose daylong interview describes Portsmouth life a century ago. We go inside the island’s mail service and village school – and learn why this flourishing village emptied out after two centuries of existence. Portsmouth: The Way It Was, which includes a new foreword by award-winning coastal author Ray McAllister, is being republished in an enhanced edition. Included are more pages and photographs, enhanced photo reproduction and a keepsake hardcover binding. Ellen Marie, who was involved in the early phases of the project, passed away in December 2016. The book was completed with the assistance of her daughters. Ellen Fulcher Cloud was the author of three books, including Ocracoke Lighthouse and Old Salt. A native of Ocracoke Island, she was a local historian, preservationist and genealogist, as well as an accomplished sketch artist.